Much like buying a freestanding tent, the SubLink system takes the guesswork out of shopping for a hammock setup. It’s all here: Hammock, rain fly, bug net, stakes, suspension system. 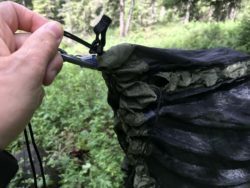 ENO has put together their lightest weight offerings for ounce-counting tree sleepers, which means your entire shelter system weighs in at just under three pounds for some serious comfort. ENO includes instructions (with cute illustrations) for all of the components, but I figured I’d try to set it up without reading the instructions because A) I am lazy and B) I wanted to see how intuitive the system is. It’s easy, it really is. The first night I used it I was car camping, because I wanted to make sure I could set it up, forget sleep in it. The backseat of the car was the backup plan. Luckily, I didn’t need it, and now I’d like to find an apartment with load-bearing poles in the middle so I can sleep in a hammock every night. Getting rocked to sleep rocks. I ended up taking it with me on every trip after that. Not having to worry about a flat place to camp, plus the convenience and weight of the package made it a no-brainer. Hammock sleepers looking for a complete system in one package, with all of the components being among the lighter-weight options on the market. All of the components included in the SubLink System are available to purchase separately. The only reason I would do this is if I wanted to size up in the hammock. I’ve linked to all of the items separately in the below descriptions. Sub7 Hammock: 6.5 ounces, 300-pound weight limit. Packs down to fist-size. Incredibly strong for how lightweight it is, made from Dyneema line and ripstop nylon. Hammock comes with lightweight carabiners for attaching to the suspension system. At less than 7 ounces, this is among the lightest hammocks out there. 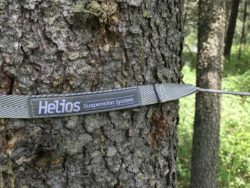 Helios Suspension System: 4.1 ounces, 300lb weight limit. These are made from Dyneema hardline with a poly-blend, tree-friendly sling. They’re easily adjustable, incredibly lightweight. Once the webbing is around your post or tree, you can adjust for tension and height with the “buried splice” on the cordage. The straps are 8 feet long, so even my awkward setups still worked fine. ProFly Sil Rain Tarp: 1 pound; 126×76 inches. This is where you gain some weight with this system. Industry-wide, it’s still super light though, and honestly if you’re packing a hammock and you don’t bring a rain cover? It’s probably going to rain on you. This was easy to set up, and the guy lines staked out tightly over top of the hammock / bug net combo. 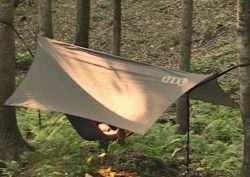 I’d also pack this tarp around when I’m not using the hammock system. My gear stayed dry underneath it on the ground. Guardian SL Bug Net: 1 pound, drawstring enclosure. I would leave this on the hammock once you’re out hiking, and just unroll the whole thing and string it up. You need to feed it over your hammock, and like I said before, pull it up over your head and pull the drawstring shut. This means it’s never 100% closed like it would be with a zipper, but after a few tries and some good balance/core tension, it’s easy to maneuver. I did get caught up in the drawstring, which for anyone who knows me, is not surprising. I carried the SubLink system on multiple overnight and extended trips, all in Montana. The weather ranged from night temps of 35-55, and included rain, wind, and the rare temperate evening. There was never a shortage of trees to set up in, even if my companions were lacking a flat area for tents. This system goes up fast. I recorded myself setting it up and it took just over 3.5 minutes, including the bug net. The Sub7 Hammock strings up in just over a minute, way faster than I set up tents. The system saves weight by not including a zipper on the bug net, which was tricky for me to figure out at first. 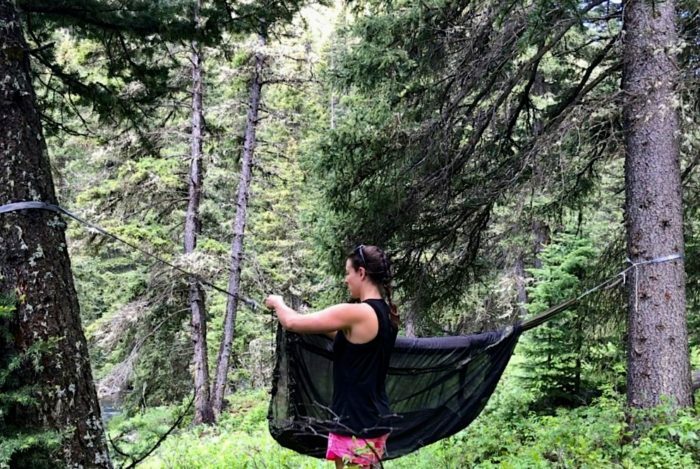 You slip the bug net over the hammock before stringing it up, scrunch it down to the end, then climb into the hammock before pulling it over your body on the line, and securing the drawstring over your head. After a few times, this made sense, but the cords were getting confusing from my vantage point inside the net. The rain fly took a few more minutes to string up and stake out, but again, it’s very basic. 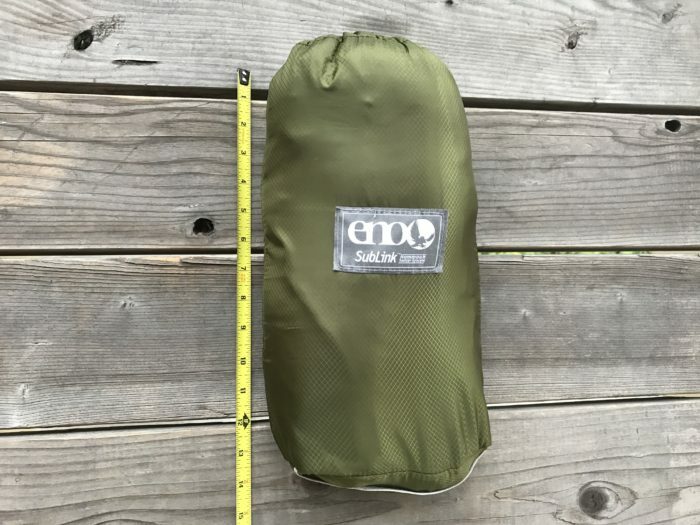 The Sub7 Hammock is much smaller than the classic ENO DoubleNest, but at 6.5 ounces, that should be apparent. Because of the smaller size, it can be unnerving to shift around in. Until you figure out the balance and a good position, I wouldn’t recommend flopping around as you doze off. I may or may not have fallen out of it… but only once. Once you’ve found a good position, it’s super supportive and comfortable, and the bug net stayed out of my face. I did wake up when I wanted to shift positions, which made me grateful I had the subconscious self-preservation not to flip myself onto the ground. More adept hammock sleepers might not have this issue. This is actually one of my favorite parts about this system. I use a regular-width EE Revelation Quilt. Oftentimes the quilt has felt on the narrow side, but I’ve never loved it more than when I used it in the hammock. The walls of the hammock tuck the quilt up perfectly, and I never worried about it slipping off my shoulder. I recommend a sleeping pad with hammocks. I have a NeoAir XLite, which protects from air drafts underneath you. ENO makes hammock-specific sleeping pads, but I wanted to make sure that this system would work with my current sleep system. The Sub7 eliminated slippage/cold spots. I also have a Sea To Summit pillow, which ended up being a pain to keep in the hammock. The way I was positioned put the pillow at the choke point on the hammock, so it bounced out a few times and I had to retrieve it from the bug net. The system comes with a fleece-lined stuff sack that you can put clothing into and use as a pillow. This heavier option might work better. Lightweight, durable, sleek, and efficient to set up. ENO are hammock experts, and this system is literally put in your hands ready-to-go. All components work together flawlessly, and with a few practice runs it’s incredibly easy to set up. Honestly, hammock sleeping is. just. so. comfortable. The Sub7 Hammock is definitely small. I am 5’6″ and 135, and there were a few times I felt like I was going to flip out of the hammock if I moved too much. The weight limit is 300 pounds, but I’m not sure how secure larger people would feel in the hammock itself. I would absolutely recommend this system to anyone looking to have the guesswork taken out of their shelter system, whether they’re hammock pros or newbies. It literally comes in a neat little package, with the lightweight, durable components chosen for you. This system is beautifully designed and executed, and hammock camping is really terrific. If you are looking for a larger hammock, all of the SubLink components are available to purchase on their own, you’d just swap out the hammock. 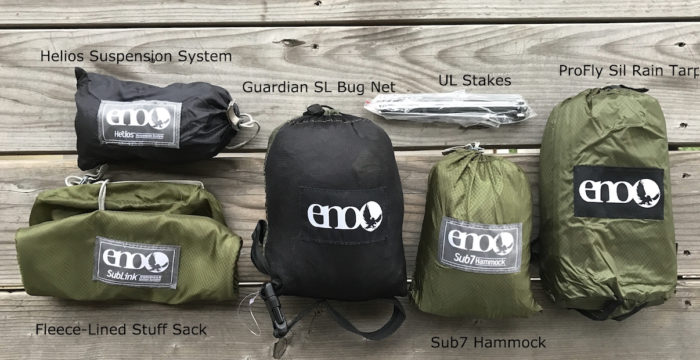 I recommend the ENO DoubleNest… check out their nifty Appalachian Trail edition here. Nice set up. I looked into the Sub 7, but at 6’3″, it’s far too small. I’m rocking a Dutchware gear 11′ hammock with a few modifications, some 12′ kevlar tree straps that knot right onto the hammock, a Hammock Gear tarp w/ doors, and a bottom entry bugnet. If you ever decide to truly dive down the rabbit hole that is hammock camping, the websites I recommend are hammockforums.net, dutchwaregear.com, and hammockgear.com. If you go on Dutchware they have 11 ft hammocks for about the same price as an Eno. If you lay in one of those you’ll never go back to a shorter hammock. Whatever you use good luck and have fun. The absolute lightest hammock I could find for my thru hike was humming bird single at 5.2 oz. The whoopee strap system is also lighter than the ENO one. The hammock uses a soft link attachment system which eliminates the carabiner ENO uses. That bug net also seems a little heavy, Dutch wear maks a sock one that works awesome. 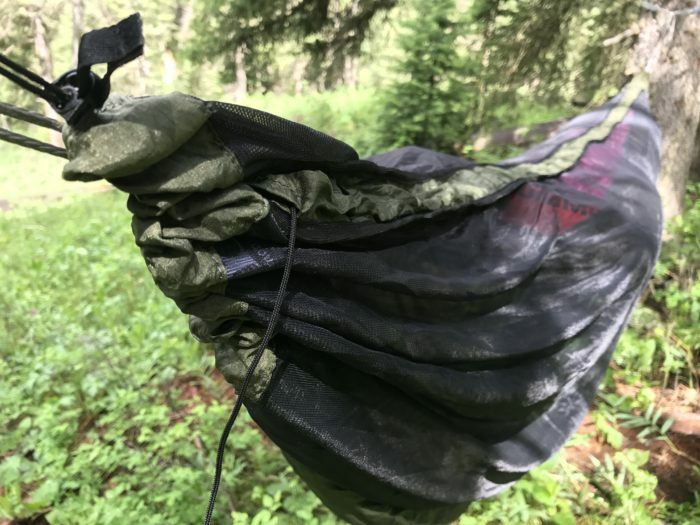 I have seen several guys and gals rocking the double nest out on the AT and I can attest owning one that they are super comfy and for me the gains in comfort of a bigger hammock far outweigh the marginal weight savings of a tiny hammock. Thanks for reviewing some hammock stuff! Thanks Chris! It’s neat to look into a whole new way of camping and get to check out all of the options. 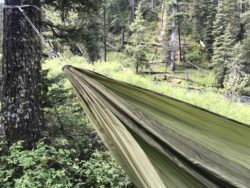 Hammock camping is gaining popularity and we’re stoked to introduce more product reviews and content about it. Party Down. Various other intriguing merchandise allow me to share tiaras, teaser games, party masks, party hats, feather leis, feather head of hair scarves, along with feather bouquets.